Alright, I've decided to start posting some of my classic customs. I'm going to list my units in thematic, semi-thematic or otherwise, 'packs' or 'releases', just because I think it's a fun thing to do. I'm also going to post 'Books' (renamed 'Tomes' at Trex's suggestion) for each unit within this thread, both because it's fun and because it allows me to convey more information at a glance. For the synergies part of the book, I will be listing Official Classic, Valhalla Customs, Competitive Unit Congress (not all of which I use, so not all of which will be taken into account when designing - those I use will be listed normally, whereas those I do not will be listed in Red), My Classic Customs (and possibly My Superscape Customs, at a much later date), Other People's Customs (yeah, a weird thing to do, but I do use units made by other custom creators which I take into account for my figures, and may even end up building a unit around), and Marvel and C3G. Last edited by Lazy Orang; April 8th, 2019 at 07:44 AM. The figure used for this unit is a Horrorclix figure from The Base Set. Its model number and name are #070-072 / Tickler. When attacking with Ulixes, all skulls rolled count for one additional hit. Ulixes must attack all figures adjacent to him. Roll each attack separately. When rolling defence dice against a normal attack from an adjacent attacking figure, if Ulixes is not destroyed by this attack, all skulls rolled count as unblockable hits on the attacking figure. Valkrill has summoned a new warrior to his side - a fiend born of dark energies and evil thoughts. This is a creature consumed by an unquenchable rage, which compels it to lash out with its vicious appendages at all nearby, any sense of reason or strategy lost within its crazed mind. Its strikes may be unaimed, but its claws are sharp and its limbs strong, more than capable of eviscerating foes or ripping off heads and limbs indiscriminately. The one saving grace of fighting this foe is that it lacks any inclination to defend itself in its insane haze, and its skin is soft enough for a sharp blade to cut without trouble. Any warrior willing to attempt to reach their sword into the swirling maelstrom of deadly limbs is either extremely brave or extremely foolhardy, however, as they are at least as likely to come away without an arm as they are to pierce the demon’s flesh. This berserker will serve Valkrill well indeed. 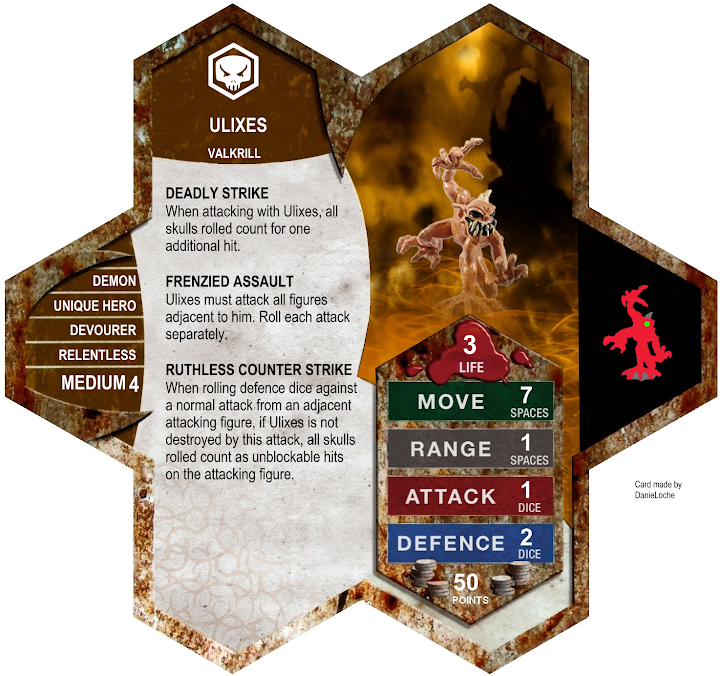 Ulixes is designed for use with white combat dice or Valkyrie dice, and it is the skulls you roll when defending which count towards Ruthless Counter Strike. Ulixes must attack all figures adjacent to him, including friendly figures, even if there are no adjacent opponents' figures for him to attack. As a Medium figure with the Relentless personality, Ulixes may take a turn via the Death Knights of Valkrill’s Unholy Bonding Special Power. 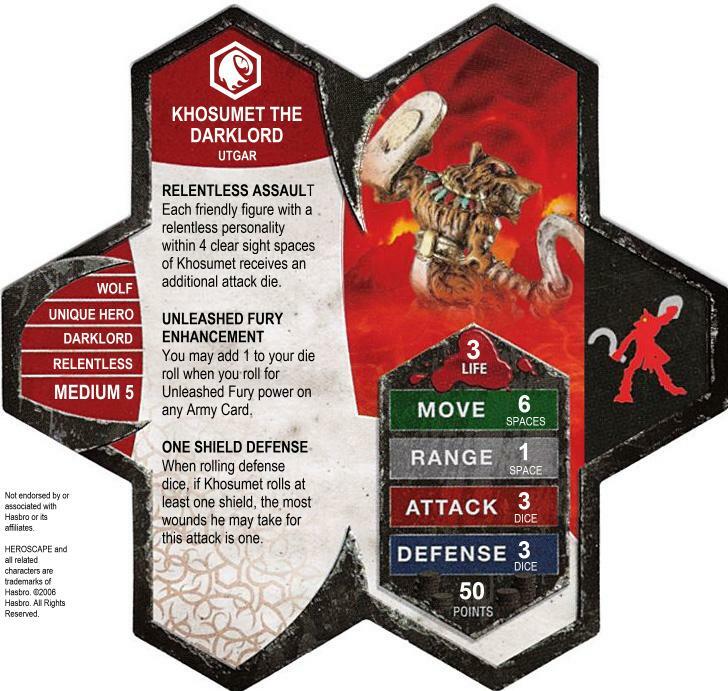 As a Devourer, Ulixes may add one to his attack via the Dumutef Guard’s Devourer Attack Enhancement. As a figure with a Range of 1 who follows Valkrill, Ulixes may add one to his attack via the Skull Demon’s Valkrill Attack Aura special power. Having a Relentless personality, Ulixes may aid the Knights of Blackgaard with their Relentless Army Attack Bonus. As a Demon, Ulixes cannot be affected by aspects of certain special powers. Current special powers that Interact Differently with Demons. As a Demon, Ulixes interacts differently with certain special powers. Current Special Powers that Interact Differently with Demons. Last edited by Lazy Orang; November 4th, 2017 at 06:11 AM. I like the idea of what your doing here. On a separate note, I would call each of them something other than "The Book of" to keep them from being confused with the official releases. In HOSS, they use "The Holocron of" and in HOF they use "The Chronical of" Otherwise very cool. Also, I love your Ulixes card. Frenzied little devil thats got to get him some blood. We ask that you do not use the title "BOOK" for C3V or SoV units without permission to preserve the quality and avoid confusion. Thanks! Please PM Dad_Scaper for permission before creating a C3V/SoV Book. Stunning (and bilingual!) graphic index here. Thanks, @DanieLoche ! Table showing all the units with links to mini info and where you can buy them here. Thanks, @lefton4ya ! Ah, didn't know it was under unofficial copyright - thanks! They're Tomes now. @Lazy Orang , official, unofficial, who knows. I look forward to seeing more of your customs. I like the ring of TOME as well. I'm really impressed by frenzied assault. it is an excellent power that fits the card well. I'm not felling the counterstrike but I can see where you are going. Crap! Just realised I made a mistake sending out the edited card to @DanieLoche ! The second sentence of Frenzied Assault made him far too powerful as a hero killer, so it had to be cut! I'll see if he could sort that - should have been more careful. Sorry. Have you tried Ulixes with multiple Dumutef? Probably too hard to pull off but those stacking attack dice with Deadly Strike could be nasty. Nasty for about 5 seconds - it would result in some very dead Dumutef. Plus, I have no idea how you'd manage to set that up. Probably the best build to make the most out of this guy would be Khosumet (CUC) and Death Knights - using him with official Khosumet, Skull Demons or Dumutef is just risking harm to his leaders. Of course, he's also eminently usable as some good 50 point filler, ala Marro Warriors, Tarn Viking Warriors, Me-Burq-Sa, Arkmer, Brave Arrow or Kursus. Very nice to see another Custom thread popping up. I look forward to your future releases. Okay, the card's fixed! A thousand thank yous to DanieLoche on this one - he fixed my silly mistake.